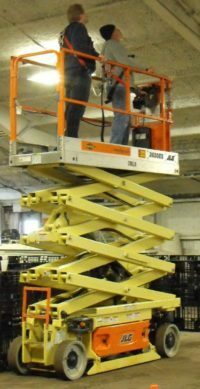 Elevating Work Platforms (EWP) are sometimes referred to as Aerial work platforms (AWP) and man-lifts. 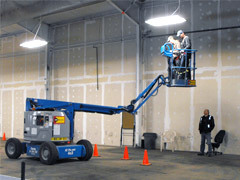 WCFF can provide practical time on the scissor lift, boom lift or both. Additional charges may apply. Elevating Work Platform Powered Mobile Equipment (PME) training courses provided by Western Canada Fire & First Aid follow the guidelines and principles outlined in Part 19 of the Alberta Occupational Health and Safety Code as well as those established by the Canadian Standards Association and recommendations by the Canadian Centre for Occupational Health and Safety (CCOHS). The PME programs cover the basic knowledge and skill requirements for the safe operation of the equipment.